Last week Audi announced that they are ending their extremely successful World Endurance Championship program. Today Autocar is reporting that Volkswagen is about to announce the end of its World Rally Championship program. (Update: Autosport has confirmed the decision is official as of Tuesday morning.) It’s most unfortunate, since Audi and VW have dominated both racing series for as long as they’ve been in them. But it’s also not surprising, because Dieselgate, and it’s not like Audi’s race winning diesel technology is going to have many fans anymore. But let’s get real. Electric cars are here to stay. They’ve been here since the 19th century, but only recently has battery technology improved to the point of making their range feasible for the average driver. Tesla has succeeded in making electric cars cool, like fezzes and bow ties, and the upcoming Model 3 has pushed mainstream manufacturers like GM into creating electric cars for the masses like the Chevy Bolt. And now, here comes VW. It’s not entirely by choice – part of the Dieselgate settlement requires VW to make a $2 billion investment in electric cars. But they were already dabbling with the e-Golf and soon to be discontinued Jetta Hybrid, so they won’t be starting from nothing. Think electric racing isn’t serious? Think again. Since 2010, the Isle of Man TT has offered the TT Zero class for electric motorcycles. Even if you’re not a motorcycle enthusiast like me, you’ve probably heard of the TT, the 37.733 mile road course (literally, roads) through several towns on the Isle of Man. Even the slowest 125cc bikes average more than 110mph and regularly nudge 200 on the straights. That includes the TT Zero bikes. The current record holder, John McGuinness – yes, that one – set a new record lap time last year of 18:58.743, with an average speed of 119.279mph. That’s faster than the 125s, by the way. Electric racing motorcycles are serious business. Another racing series that Volkswagen has recently dominated is Red Bull GRC. Scott Speed and Tanner Foust fought closely for the win in a 1-2 finish, while VW easily won the manufacturer’s championship. Given Audi’s WEC announcement and VW’s pending WRC announcement, can it be long before they also withdraw from Red Bull GRC? The same reasons that have caused VW’s withdrawal from other series will quite possibly cause them to withdraw from the Supercars series as well. But coincidentally (or maybe not), Red Bull GRC recently announced the addition of an electric series for 2018. Given Audi’s new effort in Formula E, it seems entirely plausible that rather than leave Red Bull GRC entirely, VW might shift their efforts toward this new series instead. They already have cars and drivers that win, so they’d already have a head start in the electric series. It could also go a long way toward restoring VW’s tarnished reputation in the US. 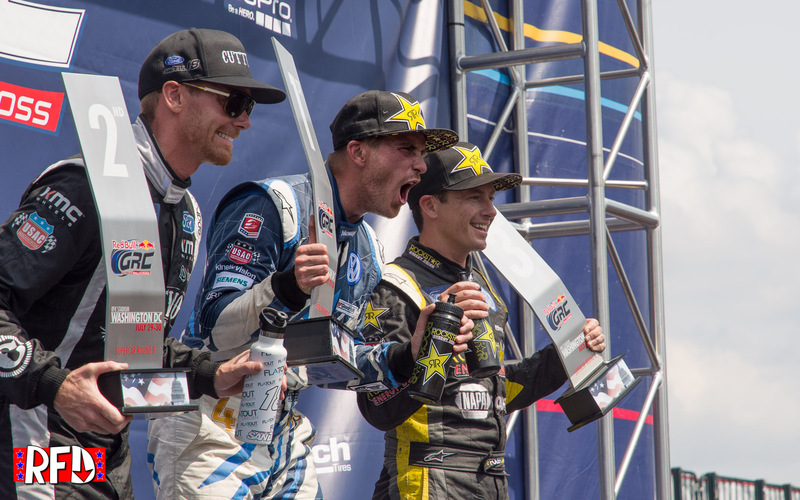 RFD loves Red Bull GRC because it combines all of the best elements of several types of racing into an exciting series that’s fun to watch and works well on TV. If VW could dominate an electric series the way they dominate Supercars – and I believe they can – it would be a very public demonstration of their accomplishments in electric car technology. It may also spur other manufacturers to join them. I’d love to see electric Beetles compete with Chevy Bolts, and even Tesla Model 3s. It would also be sweet to see some electric Ducatis – a VW brand – in TT Zero. They may not roar like the internal combustion engines we’re used to, but electric racing is a growing area in motorsports as electric cars become more mainstream. In fact, racing will probably help electric cars become more mainstream as drivetrain and battery technology trickle down to production models. And remember, there are no emissions, fuel economy, or noise restrictions the way there are for gas and diesel cars. Very little adaptation from racing to street applications would be necessary. While I’d miss the rumble of a V8 or the growl of Subaru’s boxer-4, I’m looking forward to seeing what the future holds for electric cars, both in racing and in everyday life.